Grand Bahama is a foodie’s haven. With tasty, Bahamian-flavored dishes at every eatery, you’ll soon become an expert on island places to eat. There are numerous places where you can grab a delicious bite to eat on the island. Below are just a few of our favorites. This colonial-style restaurant in Grand Bahama Island is the place to eat Caribbean cuisines with Bahamian influence. The restaurant is divided into colorful rooms honoring the character of the islands. There is live music on porch every night, from 7pm to 9pm. From Thursday through Sunday, they have Karaoke Night, from 9pm-1am. Try the gluten-free, grilled grouper with spicy broccoli. Great atmosphere and a great staff. 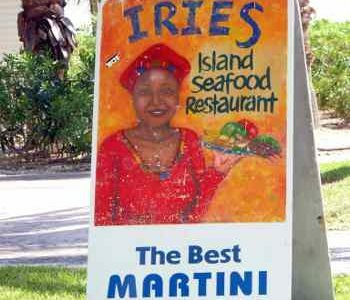 Iries Restaurant is located inside the Grand Lucayan Hotel. For Reservations, please call 1-855-708-6671. 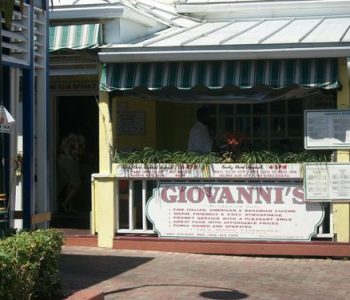 Giovanni’s is a family-owned and operated restaurant. They specialize in Italian, as well as Bahamian dishes. It is located in Port Lucaya Marketplace. They are open daily from 4:00 p.m. – 11:00 p.m., with an Early Bird Special between 4 p.m. – 6 p.m. Children under 12 dine for only $6.00. Champagne Brunch is served on Sundays and Caribbean Night on Fridays. This international buffet-style restaurant offers a wide variety of tasty dishes, from Indian to Mexican cuisine. Open Daily: (Breakfast only)7AM – 10:30 AM. Champagne Brunch is served on Sundays and Caribbean Night on Fridays. They are located inside the Grand Lucayan Resort. This popular latin-influenced restaurant is located at the Port Lucaya Marketplace. Here. you’ll find flavorful Latin American cuisine with a Bahamian flair at this restaurant. Dine inside or outside on the patio. They specialize in delicious appetizers, freshly made soups and salads, burgers, sandwiches, wraps, pasta dishes and seafood specialities including red snapper, catch of the day and succulent Langosta a la Criolla. The dinner menu has a selection of steak, pork, chicken or shrimp entres. Enjoy with a glass of fine wine. 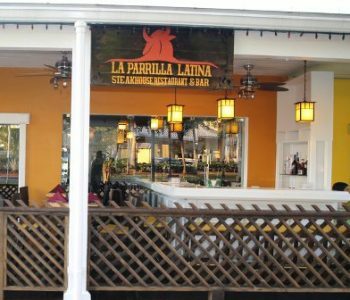 La Parrilla Latina has two happy hours daily, from 11am-2pm & 4-7pm. They are open daily for lunch and dinner 11am-until.